Sports have been inundated with maxims and cheesy clichés since the beginning of their creation. In the 2013 NBA Finals, the world experienced the essence of what sports is all about at its finest and bleakest. Let’s backpedal to Game 6 for a moment. Before that instant classic went to overtime, the Spurs had four clear chances to close that game out and become the champions themselves. However, due to two missed free throws by two good free throw shooters and two missed defensive rebounds by one of the best collective rebounding teams in the league, the Heat—well Ray Allen—fought off the death of their season, and possibly the death of their core, to live another day. 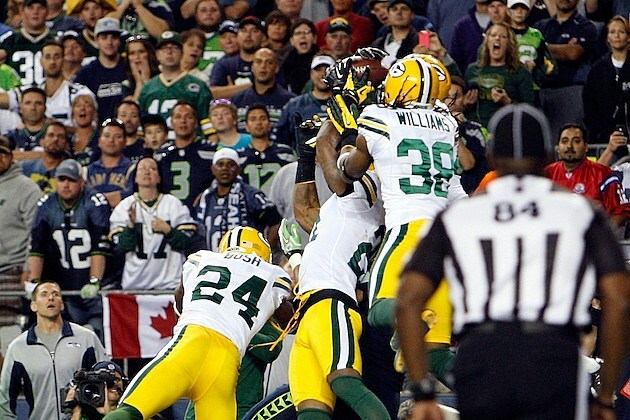 Yes, there were crucial plays leading up to this last minute of the game that could have changed the outcome. I mean, just take a look at Manu Ginobili. The man had eight turnovers and looked like he was playing the wrong sport. If he had simply cleaned up one or two of his errant passes, San Antonio could have had a larger lead toward the end. However, let’s get back to those four moments. Make your free throws. Box out. Such simple concepts of basketball that are pounded into the minds of all players of all ages. And the Spurs simply needed to apply these concepts to the game at hand. It was as if the basketball gods dangled the Larry O’Brien trophy in front of the Spurs’ faces only to quickly pull it away with one cold-blooded shot by Allen. So then we move onto Game 7, a game that many predicted would not be able to live up to the energy-draining entertainment showcased for all to see two days earlier. The final game of the NBA season might not have had a game-tying shot or gone to overtime, but it certainly represented sports just as well. After a Kawhi Leonard (we’ll get to this rising star in a later post) made a huge 3-pointer with exactly two minutes to go in the NBA season, the score stood at 90-88. No longer did the 100+ games or 1000+ hours each team had wrestled through up to that point matter anymore. Even though all the hard work they had put in up to that point got them to that point, that point at the end of the tiresomely long and winding road known as the NBA season would define how successful they were in traveling along that road. Get the point? The way a round piece of leather stitched together with a rubber bladder on the inside bounced would decide a nation’s and world’s view of a certain player. This has been the case for all the players in the league throughout the season…but not to this extent. This is the essence of what sports is all about. The realization that any one play could be the difference in what defines this year of basketball and this era of basketball. Back to the game. After a Tony Parker steal, Leonard had the chance to vault himself from rising star to shining star. He had a basketball in his large hands, was standing 22+ feet from a 10-foot rim with an 18-inch diameter and had the opportunity to change the outcome of the game with one 3-pointer. In two years of league experience, the 21-year-old small forward had made 106 3-pointers. The 107th would mean more than all of his previous made 3-pointers—along with free throws and two-pointers—combined. Because that’s a Game 7 and that’s sports. These two teams had been so equally matched and each had won three games up to that point, so it felt like they should change the league rules and make it to where you had to be up two games in order to win the series. But we have to move on. This isn’t tennis or volleyball where games can be played fairly quickly, allowing this win-by-two rule to come into play. These games are made up of 48 grueling minutes of up-tempo play that can be changed with the flick of a wrist and the follow-through of five fingers. Kawhi flicked his wrist and followed through with his five fingers. Two missed jumpers by the Heat allowed the Spurs to have their chance again. I’m not even going to mention the amount of hook shots and post moves Tim Duncan has made in his career…mostly because that would take a while to figure out. The Big Fundamental is in his 15th season, filling each of those with countless moves on the block. After one of the greatest playoff runs for a 37-year-old, all he had to do was cap it off by putting the ball in the hoop from five feet away. Wherever you are right now, look around you. Look how far five feet is. Got it? That’s the distance Duncan needed to throw a round object and put it through a metal rim with a 15-18 inches long net to tie a basketball game and shift this mounting pressure back to the Heat. Dribble. Dribble. One step. Two step. Turn head. Rise up. Release ball. Then the bounce of the ball on the rim gave Duncan one more chance to salvage his team’s 103-game, 5000+ minute season and turn it into a championship rather than an almost-championship. It was as if Duncan just landed on “play again” in Life and got to spin one more time. The ball bounced over to the right side of the rim, allowing Duncan to extend his arm and place one fingertip on the leather. With a slight push of his index finger, a hope of a nice roll and a chance to change history, this tip shot could have become more than just his 29th point with the right rotations. Duncan’s slap of the floor after his two missed chances exhibits his sheer frustration. LeBron James had struggled with his jumper all series long. There was a reason Gregg Popovich coached his players to give LeBron just enough cushion to entice him into rising up for a jump shot rather than barreling into the lane. His strength is his athleticism and well, strength; why not do everything you can to take that away? But LeBron didn’t care about that in the waning moments that would reflect a game that would in time reflect an entire season. The make of this one jumper not only gave his team enough of a lead that wouldn’t allow San Antonio to tie the game in one possession, this one jumper quite possibly changed many people’s perception of whether or not LeBron can shoot. Yes, he made five three-pointers during the game. However, none of those were worth more in terms of his legacy than this one shot. With a four-point deficit and 27 seconds to go in the game, if the Spurs could make a shot, they could begin to play the fouling game and hope for someone to do what Mario Chalmers did about a minute earlier and miss two free throws. As Ginobili drove baseline, he did the one thing that coaches tell their players not to do even as early as the pee-wee stage. With one hop in his steps, Ginobili capped off this game with how his Finals will be remembered—a bad pass leading to a turnover. The rest was history. The Spurs dug themselves in too big a hole, and unlike Game 6 for San Antonio, Miami made their free throws, played strong defense and grabbed their defensive rebounds in order to close this game out. Now, I didn’t just tell you all of this so I could get practice in play-by-play commentary based on my memory of last night’s game. You can just wait for this game to be rerun on television to hear Mike Breen yell Bang! like someone has just been shot. I want to emphasize that this game with these moments is what makes sports so thrilling and exciting to play and watch as a fan while being so draining and painful at the same time. Sports will draw you in and toss you out like your feelings don’t even matter. Remember how stressful that one assignment was? That’s what each of these moments was like for Leonard, Duncan, LeBron or whoever else had the chance to change the course of NBA history. This dilemma in the world of sports is a fulfilling one if you’re willing to take the good with the bad. Due to this being a Game 7 with so many game-changing, season-changing and legacy-changing opportunities for both teams, it felt like all of those changes were decided by a flip of a coin. They were so evenly matched it only seems fitting to let the Spurs have the trophy for one month before giving it off to the Heat. They were that close. But that’s a part of sports. Sports giveth and taketh away so quickly, especially in the sport of basketball that has more openings to unlock a different door of conclusion than any other sport out there. And Game 7 of the NBA Finals epitomized all of the heartache and pure joy that athletes and fans of any level experience when they invest themselves in the complicated world known as sports. As I was reading through one of Bill Simmons’ Grantland articles today, I couldn’t help but be drawn in by one particular paragraph and want to share it with y’all—my readers. After recounting the experience of watching his daughter cry after a Los Angeles Kings loss, Simmons started wondering if he should have tried so hard to influence his daughter into becoming such an avid sports fan that would go so far as to sob over a game. (I’ve been there.) The following paragraph is something that any fan out there of any sport and at any level can relate to and understand completely. People often ask me why I care so much about the sports teams I passionately follow. Why I have enough DFW-sports apparel for my entire family. Why I don’t like to talk during the finishing moments of a close, crucial game or after a heartbreaking loss. Why sports are important to me. I don’t think I could have said it better myself. Well put Mr. Simmons. Thank you. 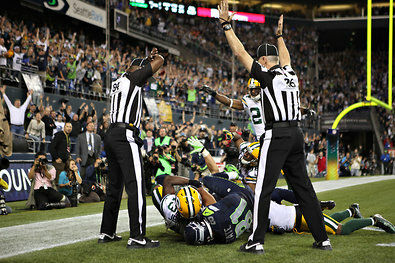 One of these ref’s calls doesn’t belong. And I think we all know which one that is. Words can’t even describe how ridiculous this fiasco of a situation truly is. This is a first in NFL history as there is a blatant push off of a defender, followed by an interception where M.D. Jennings has two hands on the ball, which all leads to a Golden Tate touchdown from a man who initially had one hand on the ball and actually took it off the ball on the way down to the ground… wait, what? To put it in Aaron’s words, it was awful. To put it TJ’s words… well, I can’t really do that. I’ve often been on the side that these men haven’t been doing as bad of a job as people like to say and that they just have faced constant scrutiny because they are under a very heated spotlight. Not this time. And this isn’t about the referees being replacement refs; this is about a crew of football referees, at any level with any sort of experience whatsoever, making a horrid call that will now go down in YouTube and league history for the wrong reason. They should now officially be stereotyped as a joke. This might just be the breaking point that forces these owners to swallow their pride, get a deal done with the regular refs and protect the esteemed NFL shield from any more mortification. ESPN.com and the TrueHoop Network are currently going through every NBA player in the league and ranking each of them in ESPN.com’s NBA section. They will usually implement one or two tweets for each player based on those that include #NBArank. After I tweeted about Detroit Pistons center Greg Monroe Tuesday morning, I was surprised to find my name and face on their website. It might not be much, but it sure excites me as an aspiring sports journalist. New York Mets pitcher Johan Santana pulled off something that Mets fans have been craving for a while. A long while. Effectively using the inside the the plate against right-handed batters and hitting all his spots, the 33-year-old put together a spectacular game as he threw a no-hitter in an 8-0 victory over the St. Louis Cardinals. The reason this holds even more significance than any normal abnormal no-no pertains to the fact that this was first in the Mets 50-year franchise history. Even though there was a controversial call on a Carlos Beltran foul ball, this should not take away from Santana and his monumental accomplishment. The way in which this no-hitter came about does not matter; what does hold significance is the achievement, and Santana brought the Mets one, tremendous achievement. Just like that, the Los Angeles Kings have come out on top of two straight overtime games against the New Jersey Devils that ended with the exact same score, following suit with their road superiority during this year’s playoffs. Jeff Carter’s Game 2 overtime goal gave the Kings a 2-1 win that puts them two games away from taking home the prestigious Stanley Cup. At this point, no one should be surprised that the No. 8 seeded Kings are blitzing their way through the Stanley Cup Final so far. Goalie Jonathan Quick has provided the backbone for the defense while Dustin Brown and Anze Kopitar seem to be hitting their stride at the right time. The Kings have only lost two postseason matches so far this year and are currently tied for the professional sports record for consecutive road playoff games won (12) dating back to last season. The word “momentum” has been taken to a new level by this group of men that won’t settle for anything short of winning it all. If Darryl Sutter can tell his team to drown out the cheering these next two games and convince them it’s another team’s road arena, this series could be wrapped up very quickly. It can be assumed 75-percent of the time that Novak Djokovic, Rafael Nadal and Roger Federer can be seen in the semifinals of any Grand Slam tournament (don’t ask me how I came up with that number). Well, the world almost saw this prediction fall short when Djokovic had a daunting obstacle to overcome Sunday morning. After looking very sluggish and losing the first two sets against Andreas Seppi, the No. 1 ranked player in the world realized he was the No. 1 ranked player in the world and finally began playing like it. He successfully completed the 0-2 set comeback by stealing a 4-6, 6-7 (5), 6-3, 7-5, 6-3 4 victory that took 4 hours, 18 minutes and moved onto the quarterfinals of the French Open. The inability to make up for lost ground is something unique to tennis compared to other mainstream sports. If a basketball team gets down by 20 points or a baseball team can’t seem to put up a run for eight straight innings, there is still an opportunity to change the outcome of the game as a whole. When Djokovic lost those first two sets, he lost those first two sets. Point Blank. That’s why elite tennis players must have excellent psychological strength and have the ability to completely forget about a big lead or big deficit going into a clean slate at a new set. Instead of looking upon this as a negative and the fact that he struggled against a player ranked 24 spots below him, I see this as Djokovic proving his mental toughness in a sport that requires just that. If he continues to push through and win games in which he has 81 unforced errors, the Djoker might find a way to win his fourth straight Grand Slam tournament. 4. Back in the Woods? After rallying from four back and birdying three of the final four holes to take home the Memorial for the fifth time in his career, Tiger Woods received the question he has dreaded for the past too-many years – is the old Tiger Woods back? He sarcastically remarked that “I feel like an older Tiger Woods.” However, even though Woods must be politically correct and avoid making a bold statement about the athlete that took golf to a level it has never been to before, this golf player might actually be somewhere in the vicinity of his former self. Why? A fist pump. After making one of the best chip shots ever, Woods showed a level of emotion he has not reached since his downfall. Woods showed a level of passion that has seemed benign to the viewer’s eye. Woods showed he might just be back. He looks to be in outstanding control of his swing, and the way in which he came back Sunday was nothing short of “Tiger-esque.” With this win, Woods now sits right along side Jack Nicklaus – who was at the Memorial as a spectator – for career PGA Tour victories. When the U.S. Open begins next week, don’t be surprised if somebody that you used to know shows up with clear intent to win his 15th major championship. When will this guy stop growing as a basketball player? Seriously? Even though Rajon Rondo has failed to complete a triple-double as he did three times in his first two playoff series, he has been the most influential basketball player on the court in the Eastern Conference Finals. As the Boston Celtics took down the Miami Heat in overtime, 93-91, to tie up a series with as many foul-outs as weird Russell Westbrook shirts (well, maybe not that many…), a shocking revelation about this series became apparent: for the first time since the Heat’s Big 3 came together, one of their playoff series is not about them. This is about the man that finds a way to put his fingerprints on every single NBA game he plays in, no matter the defense his opponent throws at him. This is about the player that did something no NBA player has ever done in the playoffs when he had 44 points, 10 assists and eight rebounds in Game 2. This is about the 26-year-old that has already tied Bob Cousy for most 10+ assist games in Celtics postseason history. This is about Rajon Pierre Rondo. Even though the Celtics have their preset Big 3 that will be the image of their 2008 championship year, they have a new Big 1 that has seemed to mature right before our very own eyes. What will he do next in Game 5? That is the question people can’t wait to see answered. Rondo has created a reason for the nation to watch a Miami Heat basketball game unrelated to the Miami Heat. Wow.